Despite being perhaps the most recognizable animal on the planet, biologists have been puzzled for centuries over how the zebra got its stripes. But scientists have worked out an answer, and it's nothing to do with camouflaging themselves in long grass. 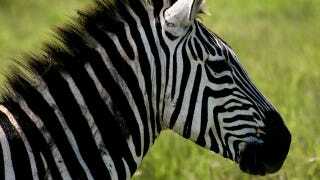 Adam Egri from Eötvös University in Budapest, Hungary, believes that zebras evolved stripes to protect themselves from blood-sucking insects, reports New Scientist. In fact, there was a theory proposed in the 1930s that suggested that tsetse flies were least attracted to striped animals, but Ergi decided to test it out on horseflies — a real problem for zebras on the plain, as they transmit several nasty equine diseases. At a fly-infested farm in Budapest, Ergi's team painted trays with different black and white patterns, then filled the trays with salad oil to trap horseflies that landed on them. The result? Trays that were painted to resemble the stripes of the zebra attracted the fewest flies. The findings are reported in the Journal of Experimental Biology.